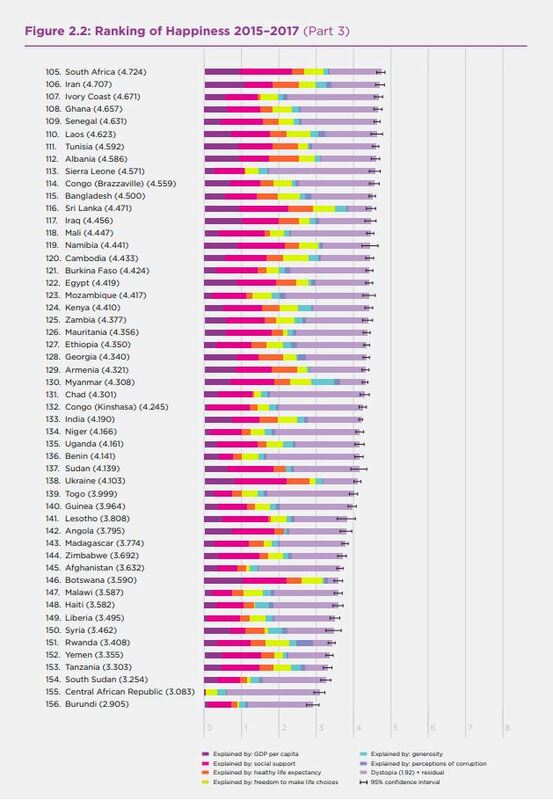 The landmark survey of the state of global happiness, the World Happiness Report 2018 has been released and one can’t help but wonder whether our happiness level as Kenyan-Canadians aligns with our motherland or adoptive country. While ranked 7th in the United Nations report, Kenya placed 124 out of the 156 countries polled. The overall rankings of country happiness are based on the pooled results from Gallup World Poll surveys from 2015-2017, and show both change and stability. Finland is the new top ranking country, but the top ten positions are held by the same countries as in the last two years, although with some swapping of places. Four different countries have held top spot in the four most recent reports – Denmark, Switzerland, Norway and now Finland. The report measured key factors that have been found to support well-being. These are: income, healthy life expectancy, social support, freedom, trust and generosity. Among the top countries, differences are small enough that year-to-year changes in the rankings are to be expected. For both domestic and international migrants, the report studies not just the happiness of the migrants and their host communities, but also of those left behind, whether in the countryside or in the source country. According to the report, perhaps the most striking finding is that a ranking of countries according to the happiness of their immigrant populations is almost exactly the same as for the rest of the population. The ten happiest countries in the overall rankings also took ten of the top eleven spots in the ranking of immigrant happiness. Finland is at the top of both rankings in this report, with the happiest immigrants, and the happiest population in general. The closeness of the two rankings shows that the happiness of immigrants depends predominantly on the quality of life where they now live, illustrating a general pattern of convergence. Happiness can change, and does change, according to the quality of the society in which people live. Immigrant happiness, like that of the locally born, depends on a range of features of the social fabric, extending far beyond the higher incomes traditionally thought to inspire and reward migration. The countries with the happiest immigrants are not the richest countries, but instead the countries with a more balanced set of social and institutional supports for better lives. The Report ends on a different tack, with a focus on three emerging health problems that threaten happiness: obesity, the opioid crisis, and depression. This meeting will take place on Friday January 29, 2016 at 130 Industry Street Unit 5, Toronto, ON M6M 5G3 starting at 6 pm. Please join us for a prayer and fundraising service on Sunday January 31, 2016 from 4 – 5pm at Consolata Centre 2671 Islington Avenue, Etobicoke ON M9V 2X6.